Menasha, WI: The 2013 Terracross Championship came to a close at the infamous Haydays Grass Drags in North branch, MN, one of the largest powersports expos/swap meets, and where you can rest assured you will find anyone involved in the industry walking around or racing. With the event playing host to over 30,000 people each year, it was the perfect finale to the four round series. Zakowski Motorsports driver Zac Zakowski was pulling double duty all weekend, racing for the championship in the premier Pro-SxS and Pro-Quad Stock classes. 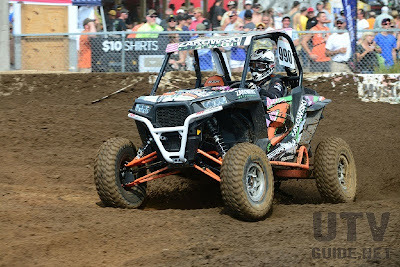 Heading into the last two rounds at Haydays, Zakowski was sitting comfortable in both classes, having taken double second place finishes in Pro-Quad Stock and a third place podium finish in the Pro-SxS class at ERX Motor Park. Being a cross country racer primarily, racing endurance style races through the tight woods for upwards of two hours in the GNCC series, the Terracross format was a new challenge to Zakowski, but would prove to allow him to stretch his legs out with no trees inches away to hold him back. In the RZR XP 1000 Pro-SxS class, Zakowski earned his keep in the stacked field of athletes, the likes of Daryl Rath, RJ Anderson, Doug Gust, and many more, as he qualified third in practice for round three and set the fastest times of the weekend for round four, qualifying him first. In round three, Zakowski had a mild rollover in his heat race which would force him to start in the back of the field for the final. Once the green flag was out, the number 990 was on a mission to get to the front, picking off one at a time in the action packed final. With a few laps left he would find himself right on the rear bumper of leader RJ Anderson, who had taken the win at the first two rounds. Running out of laps, Zac ended the race with another podium finish in second but was more than ready for the finale. With the fastest qualifying time and winning his heat race, Zac sat on the pole position for the fourth and final round. The flag dropped and Zakowski successfully took the holeshot and never looked back. Charging hard, he would lead the entire race and cross the checkers with a twenty second lead over second place. The win was not only huge in itself, but also secured third place in the overall championship standings. “This is awesome, I mean I have been working so hard to get this win and for this being my first season racing the Terracross Championship in the Pro-SxS class it means that much more to be able to come home with not only a win but a third in the championship! The class is stacked with some of the best racers in the country and it feels good to get a win for our team and a win for the Midwest!” an ecstatic Zakowski had to say after the race. In the Pro-Quad stock ranks, the number 990 charged hard in round three to take the second place spot. Zac got off to a good start and tried countless lines through the logs, rocks, and jumps to take the lead from Rory Beckman, but would settle for second, crossing the finish within a second of first. In the last final, Daryl Rath would take the holeshot, with Zac trailing hard behind him. Trying to make a pass in the log section, Zac had a small bobble getting over the logs that would set him back around eight seconds. With half a race left, Zac pushed forward, laying down the fastest lap times of the weekend but again would just run out of time before the finish, making up the time and coming in within a second of winner Daryl Rath. “I really wanted to take home a win in the quad ranks but I am happy with my performance. Since my injuries at the beginning of the season I am finally feeling like I am getting close to being 100% again. Huge thanks to Joe Duncan for giving me the opportunity to be a part of the Terracross Championship!” said Zakowski. While the Terracross Championship is at an end for the season, racing does not stop. The team will be entering into the second half of the GNCC series within the next month. Thank you to all of the Terracross Championship sponsors and partners for putting on such a great series. The last rounds from Haydays will air on the CBS Sports Network on 9/22, 9/29, and 10/6 at 7:00pm Central Standard time.